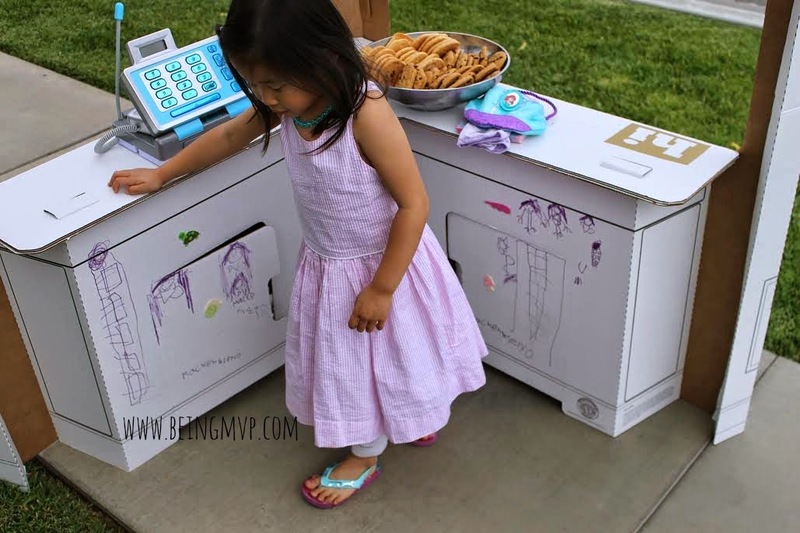 Disclosure: I received the Snack Shack and sticker set for review from Build A Dream Playhouse. All opinions are my own. 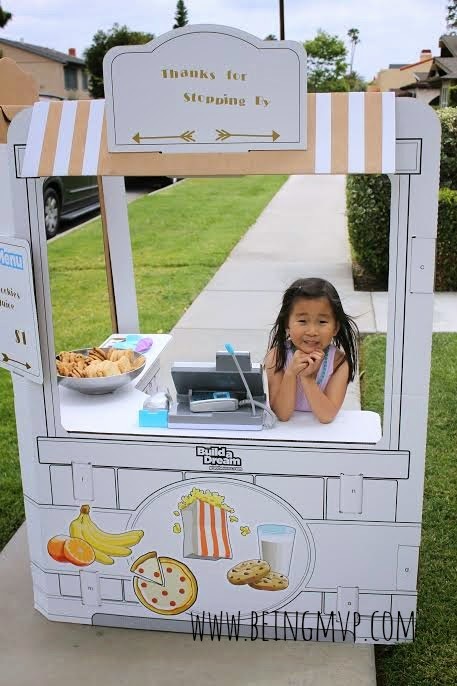 Who doesn't love seeing cute lemonade stands around the neighborhood with young children selling snacks and drinks while learning to become entrepreneurs? I was excited to get Kenzie on the bandwagon with her own Snack Shack from Build a Dream Playhouses. 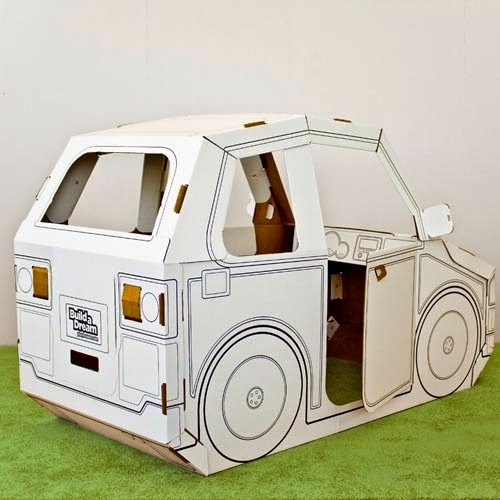 They have taken the age old cardboard box and transformed it into blank canvas playhouses for children to decorate to their heart's desire. It's a fresh and easy idea that results in a kid-friendly product which is also 100% recyclable. Since my kiddos are not quite the budding artists, I helped in the decorating of the Snack Shack ($59.99). It was exciting because both of them love preparing meals from the play kitchen and offering it to Hubs and I. The concept of actually going out to offer goodies to neighbors was new and adventurous. Your child can use most mediums on the cardboard box including markers, paint, colored pencils, crayons, stickers, etc. The construction was pretty simple in assembling the snack shack and the stickers are a must! No tools or any sort of adhesive is needed. If you minus the time spent prying little hands off the pieces, it only took mere minutes to completion. I watched the video on the website and assembled along. The kiddos went crazy with the decor! We decided to forego offering homemade drinks out of fear that Mason would spill them before a sale was made. There is storage space underneath so you can have a nice stash of goodies so you don't run out. Kenzie had a blast in her first attempt at being a shop owner but grew tired of waiting for customers. Since we don't really hang outside on the sidewalk, I didn't know how much traffic we would have. I think we need to setup shop next to the fire station next time! 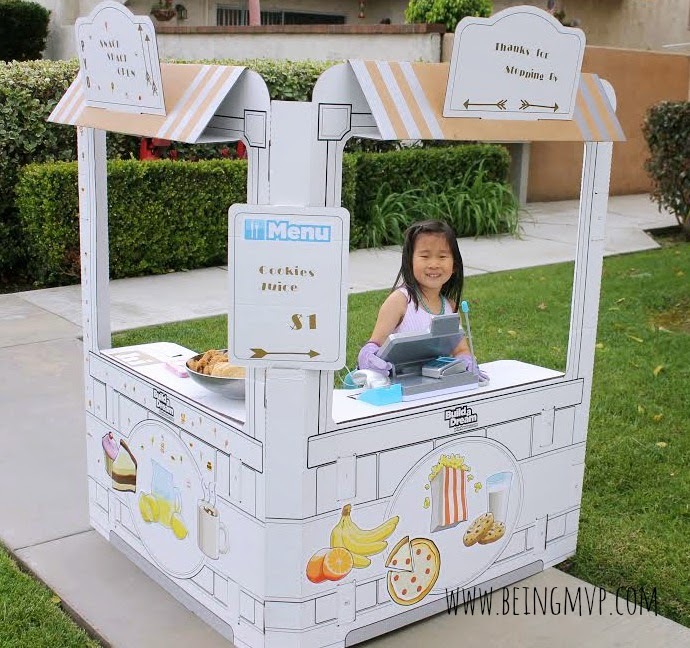 Build a Dream Playhouses also offers several other models including an awesome Imagine Wagon which looks exactly like the Ice Cream Truck ride at the mall, Pop N' Play Kitchen, Cosmic Cruiser and more. Make sure to connect with Build a Dream Playhouses on Facebook and Twitter! 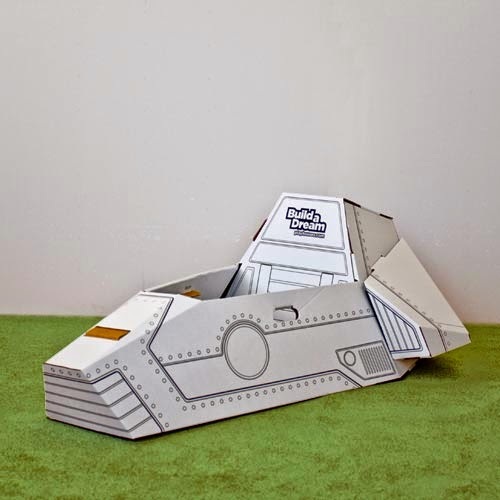 One winner will Receive the Cosmic Cruiser or Dream Machine*! I love the Pop N' Play Castle! Dd would have so much fun paying in it and coloring it! I like the pop and play kitchen and the cruiser. Oh I also love the Pop N' Play Castle! Love the Pop N' Play Castle! I love the Imagine wagon. My grandson would love it. The Pop N' Play Castle™ would be great for my son. I would love the Pop N' Play Castle. This would be for my son.